The fact that SETDA has updated its "Navigating the Digital Shift: Broadening Student Learning Opportunities" just a year after the previous edition was published indicates how quickly this segment of education is evolving. The new report rehashes what it calls the "essential conditions" for successful use of digital resources in the classroom, introduced in an earlier report: state and local leadership, equity of access, accessibility for all students, interoperability and policies that support student data privacy and security. It also adds a new consideration: leveraging federal funds. As the report noted, the ESEA Title IV-A: Student Support and Academic Enrichment program includes the option to use funds for supporting the effective use of technology for professional development, blended and personalized learning and device acquisition. The 2018 version also offers an updated collection of "exemplar" profiles of districts and states to demonstrate how others are tackling their transitions. For example, in 2015 after Metropolitan School District of Wayne Township in Indiana chose a new learning management system, the technology and curriculum departments worked together to create a "learning hub." That hub includes a digital space for housing and creating curriculum and a repository of packaged and curated digital content with single sign-on (SSO) access for staff and students, as well as a delivery method for professional learning. Teachers now have access to district-wide curriculum maps, embedded professional development and digital resources in the same environment where students are learning online. In another example, Louisiana's state law now specifies that "the purchase of electronic textbooks, instructional materials, and other media or content shall be maximized to the extent practical." 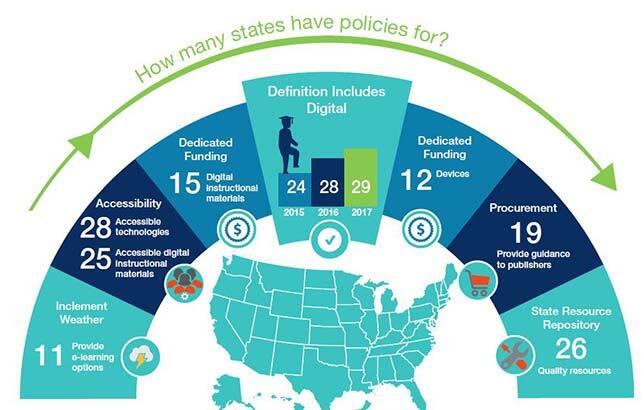 Along with the report, SETDA has refreshed its Digital Instructional Materials Acquisition Policies for States (DMAPS) online portal. The portal offers profiles for each state's instructional materials policies and practices along with an interactive map to view national trends. The organization also hosts an online community focused on the top of digital content through edWeb. The latest edition of the report is available on the SETDA website.